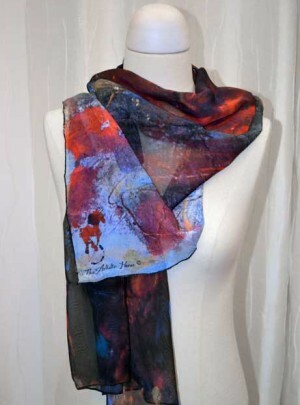 Wear a printed signature art scarf by Justin The Artistic Horse. 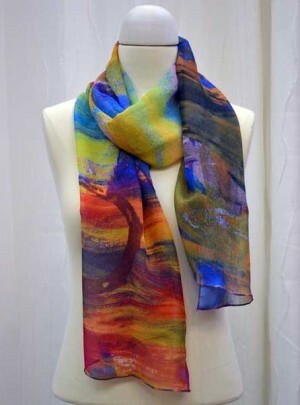 This scarf will be quite the conversation piece wherever you go. The “Unbridled Expressionistic” paintings reflect Justin’s personality they are bold, confident and playful. His technique is unconfined and he is free to place the brush where he chooses. Each painting is unique and expresses Justin’s spirited equine energy. 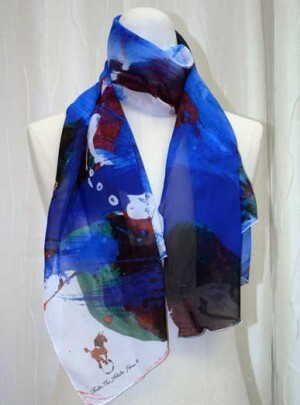 This colorful printed art scarf is reproduced using Justin’s signature painting. The lightweight poly chiffon fabric drapes softly and feels great against your skin. It doesn’t wrinkle and holds it’s liveliness all day long. 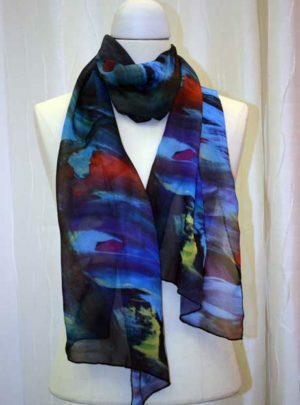 Our scarf has a variety of looks when tied, wrapped, or bunched accenting the freeform painting. It features his distinctive Self Portrait horse logo. 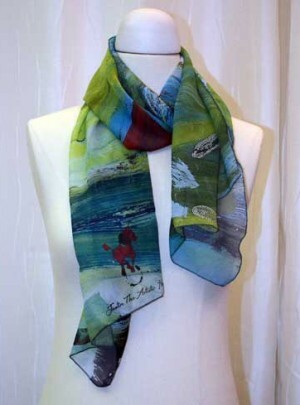 These individually produced scarves are made by hand in the USA. Wash separately in cool or warm water using a gentle machine cycle. Machine dry using a low temperature or permanent press setting and remove promptly. 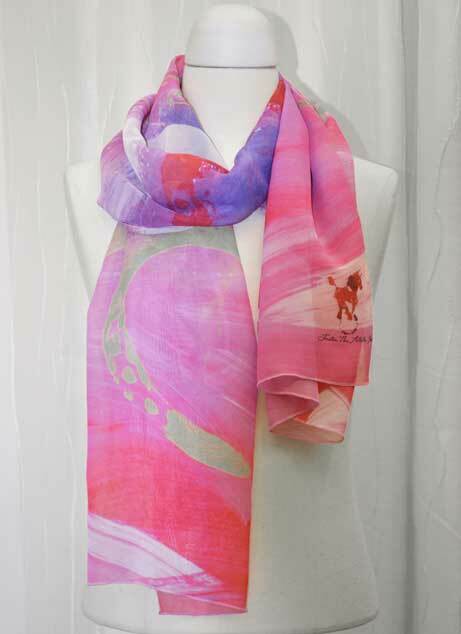 This colorful printed art scarf is reproduced using Justin’s signature painting. The lightweight poly chiffon fabric drapes softly and feels great against your skin. It doesn’t wrinkle and holds it’s liveliness all day long. 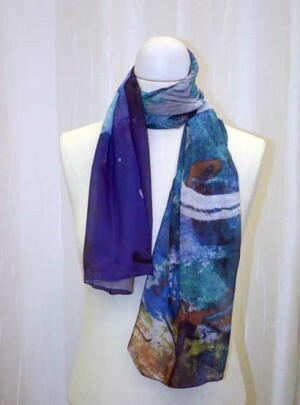 Our 60”x 24” scarf has a variety of looks when tied, wrapped, or bunched accenting the freeform painting. It features his distinctive Self Portrait horse logo. These individually produced scarves are made by hand in the USA. 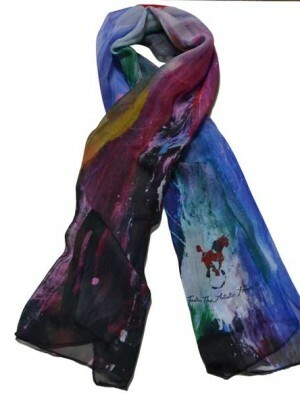 Wear a printed signature art scarf by Justin The Artistic Horse. This scarf will be the conversation piece wherever you go.